Authors of all accepted research and industrial papers will have an opportunity to present a poster during two 1.5-hour sessions. The conference will provide boards. The size of each poster should be within 1.20 m (height) x 1.15m (width), which is about 3.9 ft (height) x 3.8 ft (width). After each session, authors are required to remove their posters from the boards for safe keeping. Each demo has two presentation times. Demo presenters will have to bring their own laptops. You can also bring a poster to use during your demo presentation. Please see “Instructions for Posters” above. A 4′ x 8′ board (see the image below) for you to put your poster (if any). 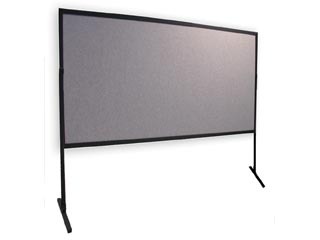 If you want to bring your own projector, we can provide a white foam board that can be attached on the poster board and can be used as a (primitive) projection screen. Please let Chen Li (email: chenli [AT] ics.uci.edu) know if you would like such a foam board.